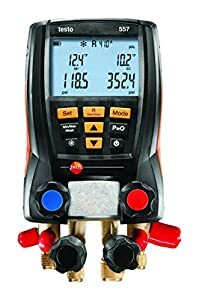 ▷Best Micron Gauges Review: Only Top-Rated in 2019! The 8 Affordable Micron (Manifold) Gauges on The Market! We created this list of the top 8-micron gauges. All over the world, air-conditioning experts use manifold gauges. These hand-held devices have evolved over the last decade and are now coming in all kinds of sizes with many different features for added utility purposes. However, their main functions are to determine the exact levels of vacuum in your air conditioning system and to present the levels of degassing and dehydration that will ensure a prolonged life of your machine. As such, a manifold gauge performs diagnosis on you’re A/C system and checks the pressure to determines if there have been any leaks. It is also a useful tool for recharging and evacuating the A/C. There are two types of manifold gauges: analog manifold gauges and digital refrigerant gauges. Both work along the same principles. Digital gauges are not new devices, but their popularity has risen in the last few years since they are more accurate and easier to read. As with all specific tools that we review, there are certain key features that must be present; these are the core features that we use to compare each unit. The KPI’s we chose is the type (analog or digital), micron reading range, dimensions, and weight. These KPI’s are our determining factors since no poor quality readers are even considered, the nuances separating the top-level devices were brought down to the most basic of features. If you want a small, no-nonsense easy to carry and implement device, then the BluVac+ Micro is your choice. It works well with smartphones and has high accuracy results. This model is one of the smallest on the market, as well as one of the most budget-friendly. It is basically a digital version of a simple Analog device. 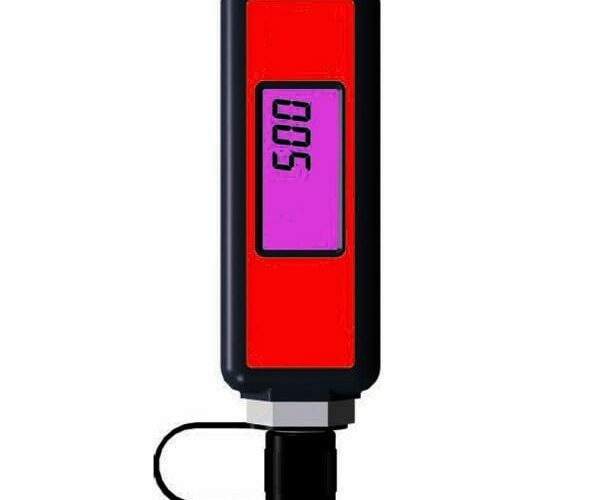 The LCD display is easy to read, and the device uses an innovative oil sensor that works with a self-diagnostic program, to assure constant accuracy. This device connects to your smartphone using Bluetooth technology. 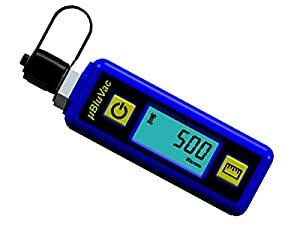 The BluVac Pro has a large 1/2″ digital display with a bright blue backlight. This model comes with two programming modes: Evacuation (EPI) and Rise Time Testing. It also provides you with ambient and saturation temperature indicators which are accurate to within 0.2°F (0.1°C). The EPI will continue to show increasing vacuum readings during pressures that exceed 25,000 Microns. This device uses the BluVac innovative oil sensor that works with a self-diagnostic program, to assure constant accuracy. The display also gives you an “Analog” vacuum level bar graph and an evacuation progress indication, vacuum leak rate, ambient temperature and saturation temperature. The built-in memory will retain all previous settings. The CPS VG200 is a great digital reader that provides one of the most accurate readings on the market. 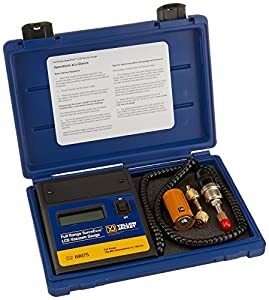 This simple gauge is what does the trick, it gives you a no-nonsense reading and comes with a Gauge Hook, Adapter “T-fitting” and Padded Vinyl Case. This model is calibrated to strict NIST standards and comes with an advanced sensor design including a self-heated thermistor bridge and automatic temperature compensator. The digital readout gives you 5 -digits, for a simple, accurate and easy reading. Just note that this is a simple sensor, it gives you a basic reading, if you need more data, such as heat transfer data for moisture recognition, then you will need a different model. 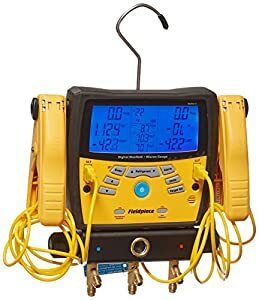 The Fieldpiece SMAN360 is a 3 Port Digital Manifold with Micron Gauge and is not for the inexperienced user. This beastie comes with a lot of features and a big display. If you want to have all the bells and whistles, then this is the unit to buy. This model works with all 45 refrigerants with easy updates via mini USB connection. In fact, the system is pre-programmed with accurate P-T charts for 45 of the most common refrigerants. It also comes with an integrated pre-set alarm, so you can decide what micron level will set the alarm off. The display will show you the superheat and subcooling calculations which are displayed simultaneously, and these units are the only ones that provide linear adjustment of the pressure sensors based on refrigerant type. The SMAN360 comes with 2 Type-K Pipe Clamp Thermocouples and a padded carrying case. This is one of the most advanced sensors on the market, and it gives you accurate readings that will let you know whether you have a leak or contamination in the system, in one quick reading. This is a basic gauge, not the most accurate (by far) but is a useful snap on a tool for a quick reference guide. Basically, when you want to get a quick reading just for maintenance overview purposes, this is the gauge to attach. It gives you a 14-level bar graph at increments of 25,000 microns and an immediate reading. This is a great quick reference reader for multiple cooling systems that require constant maintenance reviews, rather than connect up a more accurate reader; this one will give a quick review and then you can decide what to do next. The Yellow Jacket 69075 features a thermocouple sensor that is ready-to-use with no adjustments or warm-up. Pre-calibration is repeatable job after job. This model comes with automatic ambient temperature compensation and will stay calibrated after on/off switching and over long evacuations. The housing is nickel-plated steel, and the sensors are interchangeable. You can connect the 69080 sensors to this unit. What is good about this kit, but also a negative is its interchangeability. The Testo 557 is a 4-way manifold system that provides two temperature-compensated pressure sensors that automatically calculate the theoretical evaporating and condensing temperature, as well as simultaneous, calculate the superheating and subcooling ranges. This model includes a high-precision Pirani gauge with the digital manifold that provides an accurate vacuum measurement making it more efficient to evacuate refrigeration systems and heat pumps. This model has 60 refrigerants stored in the manifold and can be updated via the smartphone/tablet app. An additional temperature-compensated leakage test and automatic ambient pressure compensation are included. 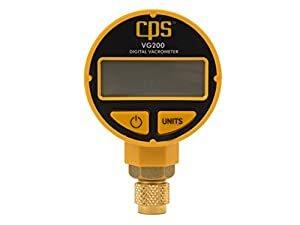 The UEi DMG100 digital vacuum gauge is small and accurate sensor unit that provides you with a clear LED backlit display. This another no-nonsense model, it provides a basic yet accurate 1-micron level resolution readout and is in-field calibrated. Essentially, this is a very simple model giving you a quick readout for first standing tests. If you need to perform deeper tests, you will need a deeper model. A thermocouple gauge is an accurate instrument for reading the variations in the air temperature as an atmosphere becomes weaker due to vacuum. A preheated sensor element is able to check the heat conduction in the surrounding air as it becomes weaker. In essence, as the vacuum gets stronger, the sensor gets hotter since the vacuum reduces the number of molecules that transfer heat away from the sensor. The end result is a comparative readout that will show the levels of dehydration and degassing a system. When releasing the sensor to the atmosphere, the sensing element is not damaged. You can easily clean the sensing element with a solvent like acetone or alcohol. Totally enclosed sensors make it harder for them to be contaminated. A/C & Refrigeration systems operate with only oil and refrigerant flowing through them. When air and moisture enter the system, it’s time to perform a degassing, which is the evacuation of the air in the system. Since air brings with it moisture, a dehydration process is also required. These two processes are called evacuation. A micron gauge is used to determine the level of the atmosphere including degassing and dehydration in a system. When a cooling unit has been opened to the atmosphere for service or installation, it is imperative that you perform a two-step degassing and dehydration check. Degassing removes non-condensable materials, these cause increased head pressures and increased operating cost. The second issue is dehydration, where moisture brakes down POE oil in HFC systems. This leads to premature failure of the oil, breaking down into its fundamental components, clogging the metering device and contaminate line sets. Correct practice is what leads to a quick and deep evacuation of the air conditioner or refrigerator system. This means that you need to follow some basic principles that are the same for every unit you come in content with. Moisture can only be removed in small quantities and as a vapor. This means that all tubing must be kept clean and dry when installing a new unit. If any moisture dirt and other contaminates compromise a system before it starts, the result will lead to immediate re-evacuation. As such, installation is the most important first step in making sure any unit will work properly for its life cycle. When you deal with a contaminated system, you will need to remove the valve cores and purge the system with nitrogen. Liquid nitrogen will remove all contaminants and moisture from the system. Perform a standing pressure test to check for leaks by using a dry gas again like dry nitrogen. It’s also advisable to use a gauge that can give you a temperature compensated pressure test. When using a more functional sensor unit such as the Fieldpiece SMAN you will get an immediate and accurate reading of all the system, so consider investing in a comprehensive sensor system, rather than one that requires changing sensors to get different readings. Most standard residential tests will take around 15 minutes to perform. Just remember that when releasing high-pressure gas take it down to about 1 psig., this will stop air from entering the system and contaminating it. It’s always prudent to test you vacuum Pump. 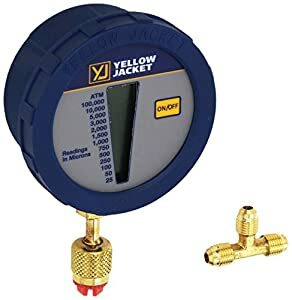 You can do this by attaching the micron gauge directly to the vacuum pump using the 1/4″ connection. You can then verify whether the pump can achieve a vacuum level of 100 microns or less. The best quality pumps will achieve levels of 50 microns and less. There is a small undetected leak. The more comprehensive micron gauges that we presented here in this guide will easily detect which one of the issues is at fault. However, there is one test that will usually work, and that is to break the vacuum with dry nitrogen and try to find it under pressure. However, make sure you don’t open the system to atmosphere under the vacuum, if you do, you will have wasted all your time and effort. Leak: the vacuum gauge will continue to rise until the atmospheric pressure has been reached. Remember, moisture requires an evacuation, and a leak requires replacement parts and an evacuation.